The sweet scent – yes scent – of orchids! Great news for orchid lovers. The most popular indoor plant in the UK is set to become even more of a ‘must have’ as three varieties of delicately scented moth orchid hit the high street for the first time. 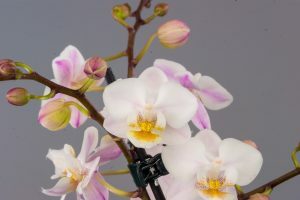 Until recently, Phalaenopsis orchids – pronounced Fal-en-op-sis and commonly known as moth orchids – have been unscented with the emphasis on their large eye-catching blooms and their ability to flower for up to three months at any time of the year. Millions are sold annually across the UK making them more popular than any other house plant. 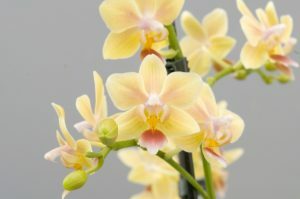 Now, thanks to British orchid experts Double H Nurseries, beauty is being combined with fragrance, as the varieties Diffusion, New Life and Sunny Smell make their way into major retailers*. To hunt them down, shoppers can look for ‘scented orchid’ stickers on the retailer own-brand plant packaging – or have a sniff! Diffusion – has beautifully rich pink/purple coloured petals. Awarded the RHS Award of Garden Merit** (AGM). New for 2018. New Life – white petals tinged with a delicate shade of pink, and yellow ‘lip’. Also awarded the RHS AGM. New for 2018. Sunny Smell – boasts a profusion of petals in a cheerful yellow shade with touches of dark pink. Was shortlisted for RHS Plant of the Year when it was first unveiled at RHS Chelsea Flower Show in 2016. Has been available in limited supplies since but this year will be more widely available. For more information on orchids plus growing tips and tricks visit www.LoveOrchids.co.uk. Double H is teaming up with floral designer Jonathan Moseley to showcase its British-grown orchids for the Royal Horticultural Society (RHS) at RHS Chatsworth Flower Show (6-10 June). Over 100 varieties will be on show in one of the largest displays of its kind. Notes for editors: * Scented orchids will be available in M&S, Waitrose, and Tesco. Prices will vary. ** The RHS AGM helps plant lovers make informed decisions when selecting plants to purchase. It is awarded to plants that are excellent for ordinary use in appropriate conditions; available; of good constitution; essentially stable in form and colour; and reasonably resistant to pests and diseases. Double H Nurseries – Family-owned Double H Nurseries was established in 1961 and supplies over 4.5 million indoor plants to UK retailers including orchids, roses, poinsettias and chrysanthemums. It is the largest British grower of orchids. 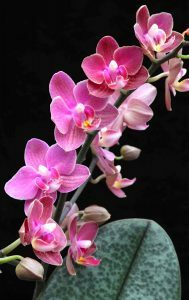 It supports the Love Orchids website which gives hints and tips on growing these fabulous blooms.